Is it helping small farmers in developing countries? 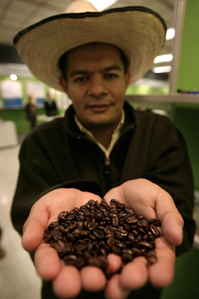 The number of products sold with fair trade labels is growing rapidly in Europe and the United States. Big chains like Wal-Mart, Dunkin' Donuts, Starbucks and McDonald's have begun offering coffee and other items. Fair trade brands hope to raise their profile by targeting consumers who care about the environment, health and fair-labor standards. Fair trade supporters say small farmers in the developing world benefit by receiving a guaranteed fair price, while the environment gets a break from intensive industrial farming. But critics say consumers pay too much and that fair trade's guarantee of a good return — no matter what the market price — sends the wrong economic signal to farmers. When the price of a global commodity like coffee tumbles in response to oversupply, overcompensated fair trade farmers will remain in an uneconomic sector long after they should have switched to some other crop or livelihood, free-market economists argue.